This three piece set will produce beautiful raised panel doors with a classic diminutive beveled profile. Designed for use in fine furniture making, this set includes two matched cope and stick bits for producing frames in 5/8� to 13/16� thick material. The stick bit shapes a decorative 3/16� thumbnail molding along the edges of the frame. The panel making bit is designed for 1/2� material. All bits are equipped with guide bearings for shaping curved work such as the small arched panel doors seen on secretaries and corner cabinetry. 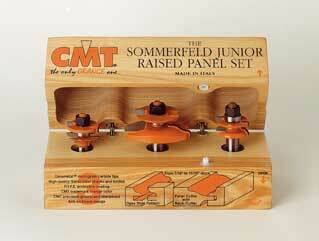 This set also produces panels for small chests and other cabinetry. The raised panel bit alone makes a nice lid for small boxes or drawer fronts. 1/2� Shanks. Instructions included.